Ellen DeGeneres wants the world to know that there are plenty of racist things out there, but she's not one of them. The talk show host issued that statement after a tweet depicting her on the back of Usain Bolt was deemed racist by some people on social media. 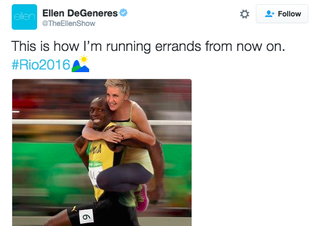 One can probably bet that Bolt will be making his Ellen Show appearance once the Olympics is over.